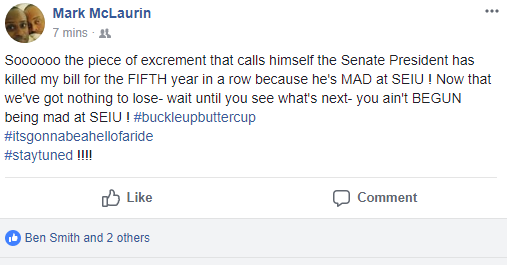 SEIU Local 500 Political Director Mark McLaurin has termed Senate President Mike Miller a “piece of excrement that calls himself the Senate President.” Not in my copy of How to Win Friends and Influence People but it’s one option. McLaurin loves a good feud like few others, so it’s not exactly shocking. Complaining about the failure of “my bill” is a double-edged sword because it highlights McLaurin’s ineffectiveness as well as Miller’s opposition. After all, he hasn’t been able to find a way to get the bill through the Democratic Senate even as lots of other liberal legislation passed. Adding the #buckletupbuttercup may prove more controversial as it’s slang for “a sensitive female” and the sort of insult normally associated with the hard right. Mike Miller probably cares less but it doesn’t provide the image I’d want for SEIU as a group that lashes out at people as sensitive or female. See Adam Pagnucco’s piece from this morning for more information on SEIU’s no holds barred effort to go after Miller.